I was born and raised in New Orleans and have been drawing and painting since I was a small child. Until 2010, I was the Director of Design & Exhibitry at Audubon Nature Institute in New Orleans, designing graphics and interpretive materials for exhibits at Audubon Zoo, the Aquarium of the Americas, Audubon Insectarium, and the Louisiana Nature Center. In the 1990s, I began study at the New Orleans Academy of Fine Art. which offers a traditional art education based on the concept that an artist must be firmly grounded in the fundamentals of drawing and painting from life. The emphasis on seeing accurately through observation from life was invaluable in my development as an artist. My main inspiration is the cityscape, and New Orleans offers a never-ending variety of styles, colors, and textures in every neighborhood. Colorful shotgun houses, above-ground cemeteries, City Park, the Warehouse District and the French Quarter have all found expression in my work. Since moving to Tennessee in 2010, I've begun to appreciate the beauty and variety in the landscape, and I'm working on learning that "language" as well. I also love to paint the human face and figure and work regularly from the live model. I am represented by Gallery600Julia in New Orleans. 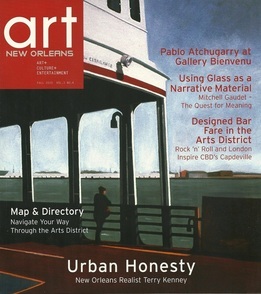 My work was featured in the Fall 2010 issue of ARTNewOrleans Magazine, and is in many private collections throughout the US. ©All Images on this website are COPYRIGHT Terry Kenney and may not be reproduced without permission.